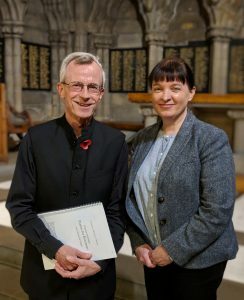 Continuing our run of world premiere performances, the choir was honoured to give the first outing (in Glasgow University Memorial Chapel) of Psalms for Rosemary, by the Orcadian composer, Gemma McGregor, on Sunday 4 November. This new setting of six ‘responsorial’ psalms for Evening Prayer was specially commissioned using funds generously bequeathed by Rosemary O’Hanlon (1920-2017), who was for years parish organist at St Peter’s, Partick and custodian of its choral tradition. The music was warmly received by the sizeable congregation who had come along to hear them; they also had the benefit of hearing two pieces by another of our Director’s choirs, the Scottish Plainsong Choir. Our picture shows our Director, Alan Tavener, with Emma McGregor at the Chapel. Hot on the heels of this premiere, we gave a further world first performance at our Farewell to Arms concert in Cathcart Old on Wednesday 14 November. This time the featured work was a new setting of ‘Dona nobis pacem’ (grant us peace) by the Belarus composer, Anna Bychkova. Full details can be found on our concerts page. Members of the choir were delighted to be asked to sing at the nuptial mass for the wedding of Sir James Macmillan’s son and his bride in Cumnock on Saturday 18 August. This marked a further step in our long-standing association with the composer and his works. In addition to his St Anne’s Mass setting and So Deep (a version of Burns’ ‘My love is like a red, red rose’), we were thrilled to perform two world premieres of new pieces by Sir James, including the glorious ‘Behold, you are beautiful my love’, a setting of words from the Song of Solomon. Despite the rather dreich weather, the event was a joyous occasion, much enjoyed by all – not least on account of the musical feast! The choir has performed for audiences all over the country. Click here to view a list of our previous performances. We're always on the lookout for individuals or choirs who share our passion for singing and would like to work with us. Keep an eye out for our upcoming performances via our Eventbrite page.